It’s the season of goodwill and the Fylde Netball League has raised £1800 as part of its recent charity efforts. The Lancashire netball league currently has over 50 teams and 350 women from the Blackpool and surrounding region playing in it. And in 2018, through various tournaments organised throughout the year, players raised a total of £1800 which has been divided equally between their three chosen charities; The Stroke Association, Parkinson’s UK and LHON Society. Hundreds of women from across the North West entered the netball tournaments and contributed prizes to the raffle and cake sales. 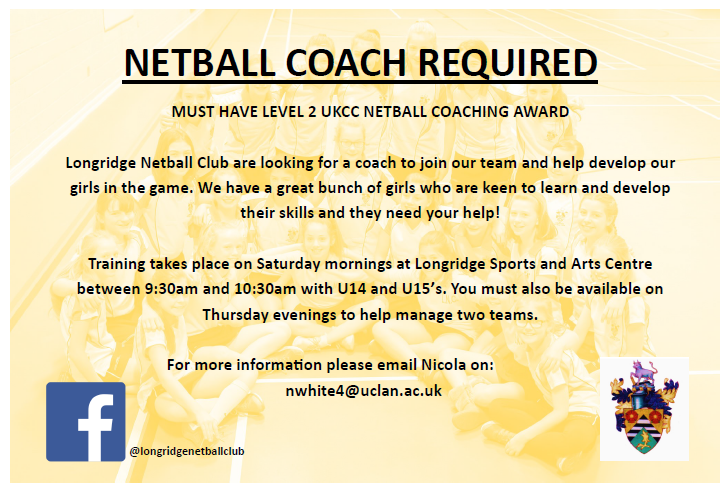 ​Longridge Netball Club are currently looking for a Level 2 coach (or an aspiring Level 2 from Level 1) to join our team in coaching and managing the U14’s and U15’s. Graduate residential assistant vacancy at Stonyhurst College.